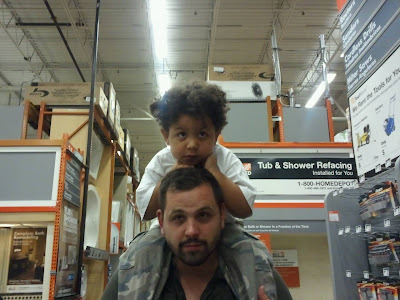 AWW MOM, ANOTHER TRIP TO HOME DEPOT? We’re still working on our home renovations regarding the foreclosure we bought. It’s been nearly a year now, and even the Toddler Tornado is getting worn down. Anytime we even drive into to a Home Depot parking lot, he starts protesting from the booster seat. Funny…. He still barely speaks English, but he’s fluent in Whine. Previous postWORDLESS WEDNESDAY – WHEN DID CARS START GETTTING "TRAMP STAMPS?" A universal language that Whine is.